Publisher My.com and developer Obsidian Entertainment has provided more details on the tanks crews and commanders for the world of modern armoured vehicle combat, Armored Warfare. In Armored Warfare the vehicles driven in battle have their own crew depending on the model and type of vehicle, and just as in real life each crew member has their own specialty. As well as a permanent crew, each vehicle needs a commander who is the most important person for improving the performance of the armoured vehicle. For Tank crews, players can choose skills for their crew based on their style of play and hardware configuration. Crew skills must be selected carefully and while they cannot change the efficiency of basic tank characteristics, some skills will perform better than others for different vehicles. Crew skills play a vital role on the battlefield. Commanders are a separate fighting unit who form part of the tank crew and act as a key element of the team. In contrast to regular crew members the commander can switch from tank to tank and because of this they have their own unique development system. For further details on Armored Warfare and to sign up to the beta, visit http://aw.my.com/. In Armored Warfare the vehicles you drive in battle have their own crew depending on the model and type of vehicle and just as in real life each crew member has his own specialty. A gunner in the artillery wouldn’t necessarily be as skilled at manning the gun in a Main Battle Tank for example. As well as a permanent crew each vehicle needs a commander who is the most important person for improving the performance of the armored vehicle. Today we will give more information on tank crews and how commanders will work. Each crew can only be used in a specific vehicle and cannot be transferred to others. Tank crews will have a customized set of skills and levels that can be increased through experience in battle. Players can choose skills for their crew based on their style of play and hardware configuration. Crew skills must be selected carefully and while they cannot change the efficiency of basic tank characteristics, some skills will perform better than others for different vehicles. If the skills are chosen correctly vehicles will instead become easier to operate, reload more rapidly or shoot more accurately. Crew skills are not a massive factor for the hardware but they do play an important role on the battlefield. For example, the difference between a beginner level crew and a level 30 crew (halfway to the maximum level) is considerable. Crew professionalism directly depends on the number of battles the tank has been involved in. The more battles; the more experienced the crew, the better they will know their tank and the more efficiently they will operate it. This increase is almost unlimited in terms of time, so players can make their favorite tanks more and more lethal the longer they play the game. Each commander is a completely formed character with their own biography, history, portrait and personality. Players will improve a commander’s characteristics independently. Commanders will improve their level as their battle experience increases and with each level they gain a certain number of points can be used to improve their different characteristics. As higher levels are reached they will be able to access to new skills to learn. Each time player reach a new level they can choose one of two skills and in this way they can create a commander with a unique set of improvements. The maximum level for a commander is 60. Competency — reduces the chances of disabling crew members when hardware is damaged. Leadership — increases the level of different skills of their crew members. Determination — this skill increases the commander’s loading skill level if the he combines this with his main duties. This characteristic also allows the commander to replace crew members that have been disabled. Perception — increases the field of vision of the tank while the commander is aboard. Eagle Eye — increases maximum aiming accuracy. Uncontainable — increases the tanks maximum movement speed. Tactical change — increases reloading speed. Each player gets three commanders at the start of the game. Later on this number can be increased. Commanders can be recruited with game currency, by achieving certain levels or by carrying out special missions. Commanders have their own qualification levels. The narrower the commander’s specialization with a certain tank, the higher the maximum level of improvements available to them and the more character points they receive per level. Generalists — These Commanders can use a wide variety of vehicles and you will receive three Generalist commanders when you begin the game. These Commanders are limited in their growth but are quite flexible in terms of vehicle roles. 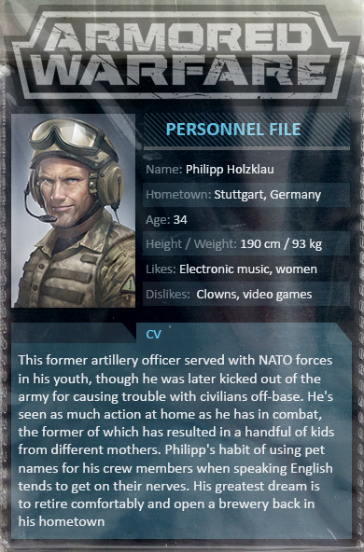 Veterans — These commanders are less common than Generalists and are more limited in their usability; for example, limited to a specific range of tiers and roles. So a Veteran Commander might be limited to Tier 1-3 AFVs/TDs. Specialists — Specialist Commanders have a narrower range of vehicles that they can drive and are generally limited to a single role. For example, a Specialist Commander might only be able to work in Tier 7-8 MBTs. Specialists gain 5 Stat Points per level as opposed to the 2 that Generalist and Veteran Commanders gain. Masters — Master Commanders are the rarest and restricted Commanders in Armored Warfare and can only command between 1 and 3 vehicles. They gain 6 Stat Points per level, the most out of any Commander class. Obtaining a Master Commander will be a significant accomplishment for players as they will become available only at level 50. Exclusive – unique commanders who players can get only during special events. Their characteristics may differ or correspond to any level of qualification from Generalists to Masters. Players will be able to get 2 of these exclusive commanders before the game will be launched. Commanders in Armored Warfare are a complex and exciting way for you to further customize your armored vehicles . You’ll have the opportunity to collect lots of different Commanders and complete achievements that reward you with the specific character you’re looking for. We hope this has given you a better idea of how Commanders will work and we’re excited to see how everyone starts customizing their own! Remember to sign up for the Armored Warfare beta here and follow us for more news and updates on Facebook, Google+ and Twitter! Don’t forget to ask any questions you may have about Commanders!